Initial sketches by Lindsey Pollock. This post is written by Jonathan Goodhand, Professor in Conflict and Development Studies in the Department of Development Studies at SOAS, and Oliver Walton, Lecturer in International Development, University of Bath. “It is true that Hambantota is the periphery and is in need of development. However, we should not blame people (from the centre). We must portray the periphery as a partner. Not as a hotbed of resistance”. The quotation comes from an interview with a prominent local businessman and political figure from Hambantota, a district in the deep south of Sri Lanka. Like many local leaders from marginal districts, this individual performs a complex role – balancing a concern with garnering support and resources from politicians and business people at the centre, with a need to maintain the trust and confidence of his own constituency in the district. Our ESRC project ‘borderlands, brokers and peacebuilding’ aims to develop a better understanding of the ambiguous and demanding role played by ‘borderland brokers’ in post-war transitions. We use the term ‘borderland brokers’ to refer to key individuals – including local businessmen, administrators, civil society leaders or politicians – who are situated in (or have roots in) state margins. We are interested in answering a number of questions about these figures. How do they become brokers? What kind of personal motivations and struggles shape their careers? What strategies and resources do they use to negotiate with actors from the centre or international arena? And how do they influence wider processes of peacebuilding and statebuilding? Last month, members of the research team travelled to Sri Lanka and Nepal to begin work on a new AHRC/ESRC-funded project that builds on our existing ESRC-funded work on borderlands and brokers by deploying a new and innovative method for documenting the life histories of these brokers: using literary comic strips to develop narratives that are co-produced by respondents and local artists. 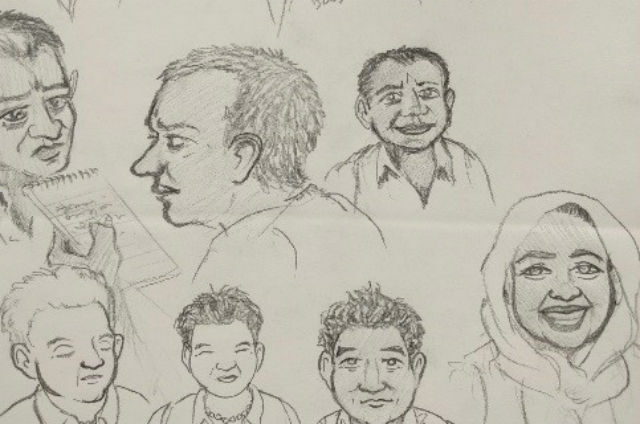 The research is being conducted in Nepal and Sri Lanka by Oliver Walton at Bath, Jonathan Goodhand and James Caron at SOAS, and Ben Dix, the Director of PositiveNegatives, an organisation that produces literary comics about contemporary social issues. As well as providing an engaging and accessible means of representing the brokers’ lives, the narratives developed through the comics seek to present a more complex account of these brokers than the common stereotypes about such characters, who may be depicted as heroically standing up to authority or alternatively as opportunistic ‘fixers’. These accounts reveal the complex motivations of brokers, which may combine a concern to represent marginalised constituencies with a desire to build a meaningful existence for themselves in adverse circumstances. We hope to show how their lives are shaped by a complex amalgam of pressures, predispositions and random events. In this project we view brokers not simply as free-floating rational actors, but as individuals whose actions are moulded by their wider social and political context: as figures who may not be authors of the bigger post-war story, but nevertheless play important roles as transmission belts, as claim makers and sense makers for people whose lives have been shaped by the experience of war. Our field trip last month focused on two sites – Batticaloa in Eastern Sri Lanka, and the Tarai region in Southern Nepal. During this time we conducted in-depth interviews with four borderland brokers. In Nepal, we focused on a journalist/activist from the Eastern Tarai who has worked to promote the Madhesi cause in Kathmandu, and a local leader from the South West Tarai involved in representing conflict victims. In Sri Lanka, we explored the life of an activist from the East involved in protecting the rights of Muslim women and girls, and a community leader who played an important role brokering between the LTTE and the government forces during the war, before becoming an influential figure in district-level NGO politics. These stories shed light on a range of themes including gender relations, boundary transgressions, and the politics of international peacebuilding and development interventions, which we hope to develop further through a series of academic and visual outputs. The interviews with these brokers explored how they had established themselves as brokers, their family backgrounds, personal motivations and struggles, and how their roles had changed over time, particularly during moments of rupture. We travelled to key locations (family homes, sites where dramatic incidents had occurred) and took photos and videos to create a visual record of brokers’ lives. We also conducted background interviews with local people to validate key elements of the brokers’ narratives. The audio recordings, photographs, and background research will all be used to create the four comics, which will take the form of a visual ‘scrapbook’, reflecting the complex and precarious lives of brokers and the messiness of war to peace transitions, deploying different formats including comic strips, artwork, text, maps and diagrams. The next step in the project will be to storyboard and sketch the comics. Our brokers and other respondents will have opportunities to feedback and comment on the emerging comics throughout the process to ensure the comics capture the realities of their lives. As well as providing a novel approach for understanding brokers’ lives and the wider post-war transitions that they shape, we hope that the comic scrapbooks will also present unique opportunities to engage policy audiences and the general public. During the trip, we held meetings and roundtable discussions with policymakers, academics, local artists and students. The project therefore aims to shape unfolding national and international policy debates relating to post-war transitions in Nepal and Sri Lanka on themes such as transitional justice, devolution, and inclusive post-war development.